When a car breaks down, it can mean cost and stress for the driver, something that should to a significant degree be mitigated by a good warranty. 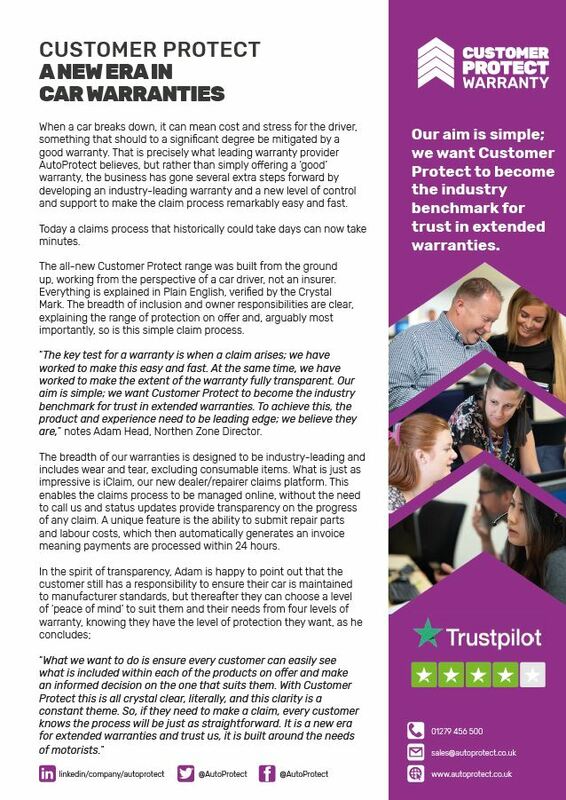 That is precisely what leading warranty provider AutoProtect believes, but rather than simply offering a ‘good’ warranty, the business has gone several extra steps forward by developing an industry-leading warranty and a new level of control and support to make the claim process remarkably easy and fast. Today a claims process that historically could take days can now take minutes. The all-new Customer Protect range was built from the ground up, working from the perspective of a car driver, not an insurer. Everything is explained in Plain English, verified by the Crystal Mark. The breadth of inclusion and owner responsibilities are clear, explaining the range of protection on offer and, arguably most importantly, so is this simple claim process. notes Adam Head, Northern Zone Director. to call us and status updates provide transparency on the progress of any claim. A unique feature is the ability to submit repair parts and labour costs, which then automatically generates an invoice meaning payments are processed within 24 hours.